Kudos to University of Toronto PhD candiate, Adrian Verster for crunching the numbers and compiling a list of the 50 most dangerous intersections in Toronto for cyclists. Haven’t seen the list? Here’s a link to Mr. Verster’s website. Here’s a link to a great article from the Toronto Star on the study. Lakeshore and Carlaw is the most dangerous intersection according to these figures. Queen St. W at Niagara Street is #2 on the list. His site starts off with a commentary stating that as a cyclist, it is “quite frightening at times with all the traffic“. I agree 100% with that comment. It can get scary out there! And I’m not saying that because I’m a personal injury lawyer, recreational cyclist and I see the worst of the worst in my field. I’m saying that because it’s dangerous out there for cyclists, regardless of the city. A lot of our clients have been seriously injured in bike accidents. Some of the most serious injuries our law firm has seen have come as a result of bike accidents. But, it’s important to note that not all of our clients are from Toronto. Bike accidents don’t discriminate age, time of accident, city or intersection. Meaning, just because you avoid these intersections, or you don`t cycle in Toronto, or do so at quiet hours doesn’t mean that your reducing the likelihood of getting involved in a bike accident. All it takes is one driver not seeing a cyclist, not paying attention, or veering slightly to the curb and that’s enought to cause a bike accident. The car doesn’t even need to come in contact with the bike. If the car veering to the curb causes the bike to also veer to the curb, then the bike makes contact with the curb causing the cyclist to lost control: there you go; accident. Not pretty. People believe that dedicated bike lanes are the answer to reduce the amount of cycling accidents. Dedicated bike lanes are great, but I have yet to see a single city in Ontario do it right. Just having a dedicated bike lane near the curb with some white lines painted on the asphalt doesn’t solve any problems. It just gives cyclists more room to operate, but it won’t prevent a car from veering off into the bike lane or vice versa. The bike lanes are also hardly visible to drivers. Vancouver did it right. Ever see the dedicated bike lanes in their downtown core? Firstly, they’re painted GREEN so that everybody can see them from the street. They have a short curb, or barrier separating the bike lane from the lane for motorists which is GREAT. That way, bikes and cars are separated. Bikes know to stay away from cars. Cars know that there’s a curb separating the bikes from veering in to their space. Everyone is happy. Even pedestrians know that there’s a separate car lane, and a separate bike lane. From what I’ve seen, this system works great. I should note that where there isn’t a curb or barrier separating the lanes, there’s a series of more clearly marked lines separating bike space, from driver space. What else works? Thinking outside the box. Bikes are smaller, and can go where cars can’t. 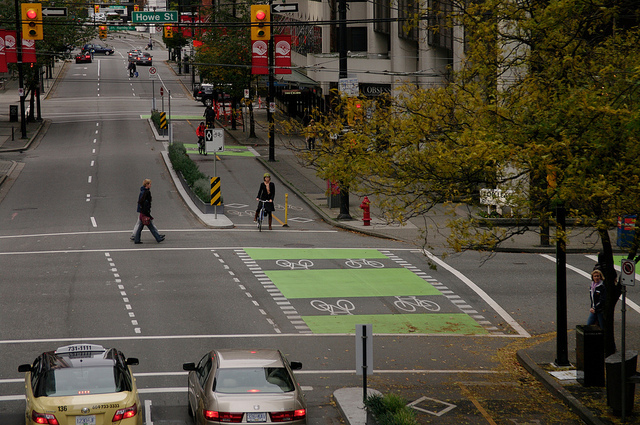 This means that cities can get creative where they put bike lanes. Through parks, natural space, along power lines, subway or railway tracks, fields etc. Dedicate more lands for bike lanes to keep them off the roads to prevent accidents from happening in the future. Example? London Ontario does a GREAT job at dedicating parts of their green space to paths for pedestrians and to cyclists. You can effectively get from suburb to downtown via London’s path system. They don’t call London the Forrest City for nothing. And town counsel has done a decent job at taking advantage of their green space to make it friendly to pedestrians and cyclists alike. We recently settled a bike accident case for $1.9M. That’s a lot of money. Why so much money? Because the injuries were serious. The reason the injuiries were serious is we have to remember that bikes don’t come equipped with ABS breaks, airbags, or steel bumpers. Bikes weigh only a faction of what cars weigh. Even the slightest knock from a car at slow speeds can result in a traumatic accident to a cyclist. In the battle of car vs bike, car wins every time. Recently, a man was taken to Sunnyrbook Hospital with life threatening injuries following a bike on car accident in downtown Toronto. The driver of the car was not charged with any offense under the Highway Traffic Act. Preliminary reports say that the cyclist was veering lanes improperly and against traffic just prior to the accident, and that the motorist could not have avoided the collision on account of the cyclist`s driving. This is significant, because in order to claim damages for pain and suffering, we must find fault on the part of the driver who caused the accident. If there`s no fault on the part of the driver, then the accident victim will not be sucessful in recovering damages. Just because you`re on a bike doens`t make you invincible. On the contrary. Cyclists are the most vulnerable people on our roadways today, and it`s important that they take great care while driving. An accident on a bike, no matter how small, will likely be more serious than a small accident in a car.